Published in the Dover Express, 21 March, 1980. There was a demand, in 1800, for houses, especially on the part of the Cinque Ports pilots, who, having their look-out station where the Lord Warden Hotel now stands, found the sites in this new street suited to their purpose. 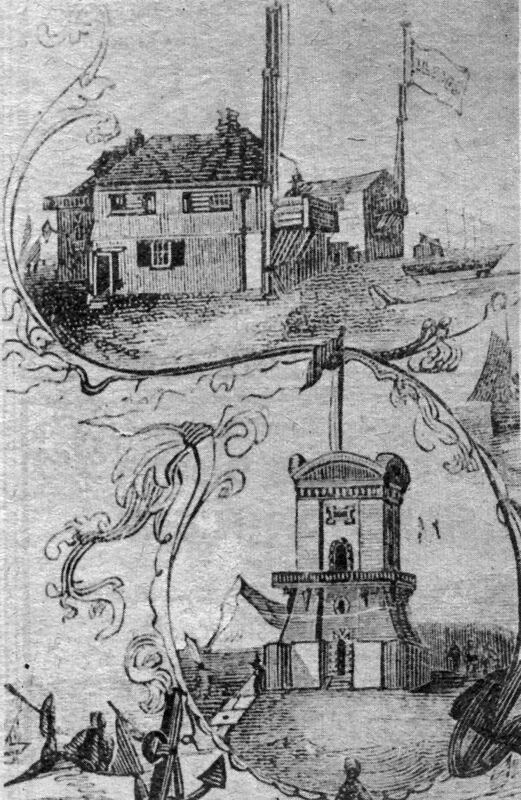 About the year 1840, nearly all the houses under the wall of Archcliff Port were occupied by pilots, many of them being the mast prominent members of the Fellowship. After the opening of the South-Eastern Railway, the exclusive character of Bulwark Street changed, and railway guards, engine*drivers, inspectors, and porters intermixed with the seafaring folk. Ten years later, the Lodemanage men had been reduced to a dozen; and by 1870, to half a dozen: and now there is not a solitary representative of the Fellowship left. Bulwark Street had no public-house in the beginning. In 1840, the victualling interest was represented by Paine's "Endeavour," and twenty years later Carter's “Archcliffe Fort“ Inn had been added. The "Endeavour" disappeared with the pulling down of the eastern side. The "Archcliffe Fort" Inn was re-built on a new site. With the alterations in the pier district there has disappeared Great Street, which joined Bulwark Street to Beach Street. Near this spot, standing on Chapel Rock, the centre of an area known as Chapel Plain till the 19th Century, there existed in the Middle Ages a chapel dedicated to "Our Lady of Pity.“ This chapel was supposed to have been erected in mediaeval times by a Northern nobleman, who was saved from shipwreck near this place; and it was restored, in 1530, by Joachim de Vaux, the then French Ambassador to England, who had also had an escape from sea peril on the adjoining shore; and, after its restoration, it seems that the Ambassador established in it a friar named John de Ponte. Eventually, the Mayor of Dover imprisoned John de Ponte for communicating intelligence to the French; and, during his incarceration, his chapel was desecrated. It was then annexed by the Dover fishermen, and, in 1570, was totally destroyed by a tempest. The original tower built by Clark to defend Paradise Harbour has now entirely disappeared. If any traces remain of its foundations they are beneath the railway line at the end of Bulwark Street, adjoining which spot stood some old houses, which had apparently been built with stone collected from the ruins of the tower. Before it was removed in 1913, Great Street (formerly known as Great Square) contained very few houses. It was a wide space, and, years ago, when the Dover elections were conducted at the hustings in the Market Place, it was the custom for the partizans of the “Blues“ to assemble with bands and banners in Great Square, and march in procession to the Market Square, to meet the "Reds,“ who marched in simultaneously from their rendezvous, which was usually Buckland Bridge. Beach Street, which has disappeared to provide more parking space for the western docks, was once a well known thoroughfare, facing, as it did, the former South-Eastern Railway terminus. This station was inown as the Town Station, and although so remote, it was at one time the only station at Dover. It ceased to be used as « railway station by the public from the outbreak of the Great War, when it became a troop train station. The cliff fall, which blocked the line between Dover and Folkestone from December, 1915. to August, 1919, rendered it useless, however, The Marine Station replaced it when the line was re-opened, and, in 1927, the western end was demolished and re-constructed in connection with the old steam locomotive shed and goods yard. 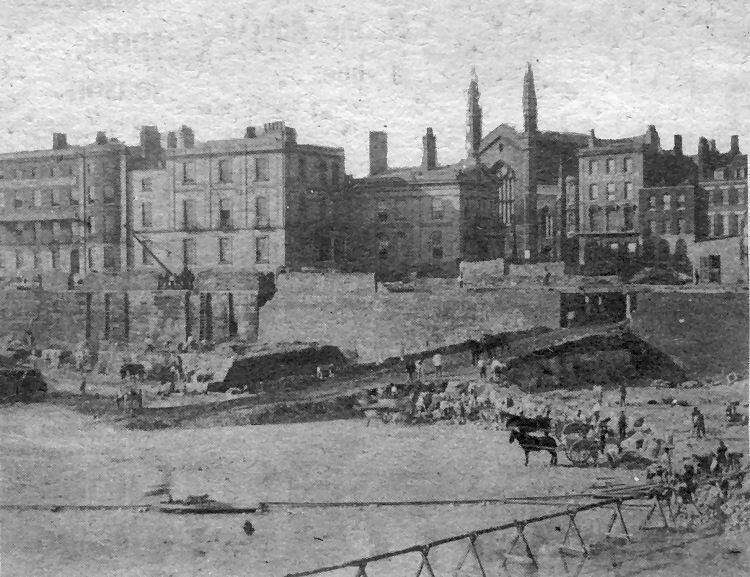 This very much faded photograph depicts the massive task which was undertaken in the early 1870s to deepen the dock basin, now known as the Granville Dock, so that it could accommodate vessels of a bigger draught. The picture, dated February 1871, was taken six years after the picture reproduced in part 67. After removing the foul sludge from the bottom of the dock navvies began the laborious task of removing 5-10 ft of solid of chalk with pick and shovel and it was taken a way by horse and cart. A temporary ramp up to a hole made in the dock wall gave access to the dockside and a system of drainpipes on trestles carried away whatever effluent normally poured into the dock from town drains. From the left the buildings on the quayside are the old Ship Hotel, the Royal Mail Packet Office, Northumberland House, Holy Trinity Church, the Harp Hotel and an old convalescent home. A quaint old print, date unknown, of the "new" and old pilot houses at Dover. The newer pilot house, below, adjoined the Lord Warden Hotel and overlooked Shakespeare Beach. A tower-like building, which has long since disappeared, it once had a single track railway line running through the base but this is not shown in the drawing. The older pilot house flied a Lloyds pennant.